On Sunday January 25, the Kool Haus had their last line up for the women’s washrooms. 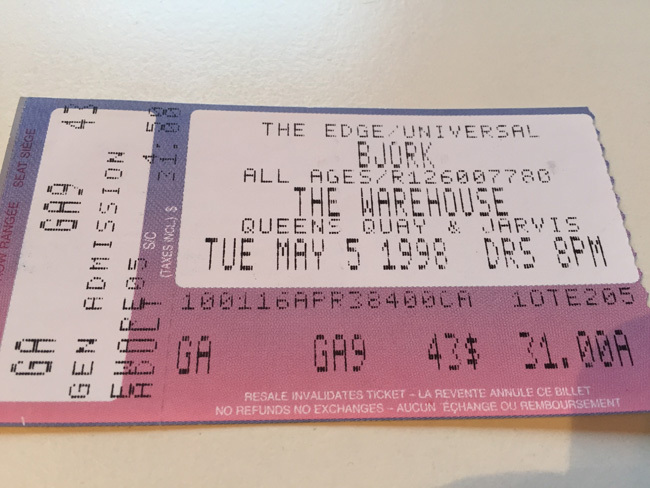 Off the top of my head, seeing Bjork in concert for the first time was one of my Warehouse/Kool Haus standout shows. It was 1998 and she was touring Homogenic. Bjork’s voice was unlike anything I’d heard before, and the concert included strings – be still my viola-playing heart. She was equally impressive a few years later at the unforgettable outdoor show at Olympic Island. When she was scheduled to play Echo Beach in 2013, tickets were $80, I was unemployed and decided I shouldn’t go. All the reviews RAVED and I quickly realized this would be one of my biggest concert regrets ever. But back in 1998 my then boyfriend/now hubs Ian and I were dating and going to movies and concerts was what we did. I really should do a retrospective on 1998 – so many concert stubs! A memory from the Bjork concert wasn’t about Bjork, but Jared Leto. This was just after the My So Called Life era. We are at the concert mesmerized by Bjork’s performance when all of a sudden, Jordan Catalano was walking in my direction in s l o w m o t i o n. Then he was in front of me. I froze. What to say to him without a)sounding like a 29 year old school girl and b) interrupting the amazing Bjork? As he walked by I reached out and touched his arm. It wasn’t a grab or tap or even a squeeze, just a light touch proving he was real and in front of me. Did he stop and turn around? Did he feel the electricity between us? I’m not sure. The spell was quickly broken with Ian exclaiming “What was that? Did you just touch him?” . Is Bjork returning to Toronto in support of Vulnicura,? I for one, can’t wait. Until then have a listen to Bachelorette. < Previous Celebrating 100 months! Next > It’s a four-way tie! Holy crud! The Bad News Bears is 40!